Today in Masonic History Richard Napoleon Batchelder is born in 1832. Richard Napoleon Batchelder is an American soldier. Batchelder was born in Laconia, New Hampshire on July 27th, 1832. He attended schools in the Manchester area growing up. In his early adult life he tried his hand at a variety of businesses. In 1861, Batchelder joined the Union Army to fight in the American Civil War. He was commissioned a first lieutenant in the 1st New Hampshire Volunteer Army. He took on the position of regimental quartermaster. Later in 1861 he was promoted to captain and became the Divisional Quartermaster in 1862. In January of 1863 he was promoted to lieutenant colonel and was assigned as the Chief Quartermaster of the II Corps. In late 1863, Batchelder and his unit came under heavy fire from southern forces. His leadership allowed his unit to come through with no loss of supplies. For that he was later nominated for, and received, the Medal of Honor. After the battle in 1863 he was promoted to Colonel and named the Chief Quartermaster of the Army of the Potomac. 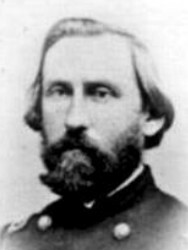 Batchelder left the Volunteer Army in 1865 and joined the Regular Army. He was reduced in rank to captain from the change in status. In January of 1866, President Andrew Johnson nominated Batchelder for the rank of brevet Brigadier General of the Volunteers. The rank was confirmed by the United States Senate in 1866. Johnson again nominated Batchelder for the rank of brevet Brigadier General in 1869, this time in the Regular Army. After the Civil War Batchelder served at a variety of commands around the country, under the quartermaster branch, for 25 years. In 1890 he was promoted to full Brigadier General. He then became the 18th Quartermaster General of the United States Army. He was put in charge of the creation of the emblem for the Quartermaster Corps. Batchelder retired from the United States Army on July 27th, 1896. Batchelder passed away in Washington, D.C. on January 4th, 1901. Batchelder was a member of Lafayette Lodge No. 41 in Manchester, New Hampshire.